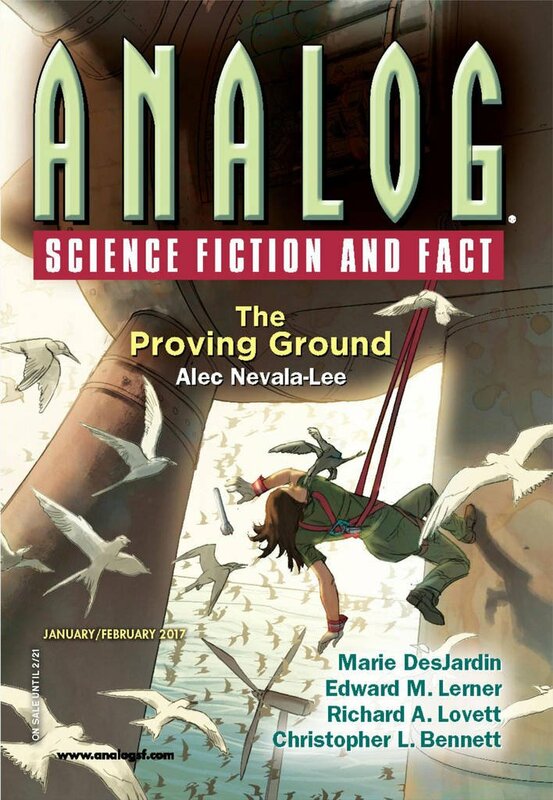 "After the Harvest, Before the Fall," by Scott Edelman [bio] (edited by Trevor Quachri), appeared in Analog Science Fiction and Fact issue 01-02|17, published on December 15, 2016 by Penny Publications. Pro: Daniel resolves his problem with Ezra--not the way he wanted to, but in a way that at least provides closure, and he cements his authority with the rest of the village. Daniel and Ezra are biblical names from the start and end of the Babylonian captivity, respectively. There's something appropriate in Daniel being the one who wants to just get along with their masters, while Ezra is the one who wants freedom. Con: The premise is hard to believe. If they could manage a full brain transplant, why couldn't they make bodies look as though they had wear and tear on them? It's also hard to buy the idea that Daniel had easy access to a drug that would make Ezra look dead yet easy to revive, and which would require Ezra take an antidote forever.